Interview Billy Easton on the new Spyder SCT 1/10 2wd. Q: What are the 5 key features of the Spyder SCT which make it stand out and why ? 1. The main and most important feature is probably true SCT suspension geometry that is purpose built for SCT tire diameters. 2. The next thing up is the purpose built side guards that reduce unwanted air flow under the body. This is crucial on tracks with big jumps and really helps keep the truck flying through the air in a more natural flight path. 3. Although we have this on our RM and MM versions, I think a customer racing the Spyder SCT will really appreciate the fact he will never loose a ballcup in a crash. 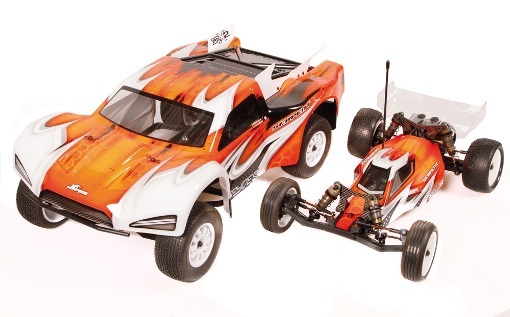 As racing SCT’s is a litte bit more bump and grind with other vehicles than 2wd or 4wd buggy. 4. The simplicity but functional front and rear bumpers is a help. The designs are simple, but the rigidity of the bumper and ease of assembly will help customers in the maintenance areas. 5. The current crop of SCT’s do not have captured axles and a fair amount of customers have driveshaft set screws coming loose. This will not be a problem as our drive shafts have fully captured pins. Q: Why did you use the Spyder RM as basis instead the MM ? A: Well… MM cars and trucks have been around for the last 4 or more years, yet a RM SCT has won every single national title. There are some reasons though. You have to consider the length of a SCT. The wheel base is extremely long and the longer you make a car, the more rear grip you will need in order to propel it in a straight line. I would also say that 90% of the customers that buy these will be racing in conditions that are more slippery and loose, so again, more rear traction will be needed. A MM version might have been nice for say astro turf or tracks where you have insane amount of grip, but I feel the conditions you will actually use this product a RM will be more than capable of doing the job..
Q: What makes the challenge to design the SCT different from the buggies? A: There really is not more of a challenge in my opinion in regards to a buggy versus a SCT. The requirements are a little different, but the performance is basically the same. The biggest troubles with SCT’s are their high CG. This means you have to pay more attention to keeping the weight that is high as light as possible. Aside from that, when driving one, there is a lot more body roll than a buggy. It takes some getting use to, but the performance from our SCT was extremely impressive in its test stages. Q: What was the hardest design element? A: To be totally honest, in this design, there are so many bodies and variants that you have to have the bumpers in the correct spot, height of the body posts. Not to high, not to low. Since we really did not SLA any samples prior, there had to be a fair amount of detail in these specifics. It’s a little more pressure on me as a designer to make sure its right. Q: How are laptimes of a SCT compared to a RM buggy, at the same track, using the same gear ? A: I actually did a fair amount of research on this during our prototype testing stage. I needed to know how big of a difference I could expect the lap times to be from a RM/MM buggy versus an SCT.I found that most other brands were within 1.5 seconds of their buggies. When I actually found a good setup for our truck, we were within 1 second, sometimes 0.75 per lap of our MM buggy in sugared high grip. This was really impressive for us, and also very positive for those that were able to witness it first hand. Q: Wo designed the body of the Spyder SCT and what are the key features? A: I actually do most all the bodies for my projects. This one in particular was more tricky. I actually did not have as much freedom as I usually do. ROAR has a set rules for all the dimensions of the body to make it as scale as possible. So before I could really invent some new something, I had to make sure the body complied with all the rules they had set for it. My main goal was to lower the weight of the body in all places I could without breaking any rules. I actually turned to the Lucas oil racing and started to look at the trucks of today. I also looked at trucks from the Micky Thompson era. During the Micky Thompson era they had higher fenders than the current Lucas trucks. So I incorporated more of that look into our body. Aside from that, I made some cool number plates that doubled as a set of rear stabilizer wings. In the end I was happy with the appearance of the body, and quite frankly, there were quite a few customers at the track that liked the look as well. Q: You have designed the Spyder range of 2wd cars in the past year, RM, MM and now SC; can you tell us what your next project is ? A: We always seem to have something going on, as our company is growing year after year. I have been working on something I feel might change the way we look at 4wd offroad cars. If you take a look at the direction we have gone in 2wd, they have really bridged the gap between the 4wd offroad cars currently on the market. The 4wd’s really are not as fast as I feel they should be. I want to make something that gives them back more of an advantage on the track, something you can actually use more power in and put the power down in a larger variety of conditions. Most of the 4wd’s of today really do not generate the traction they should, I want to fix that. 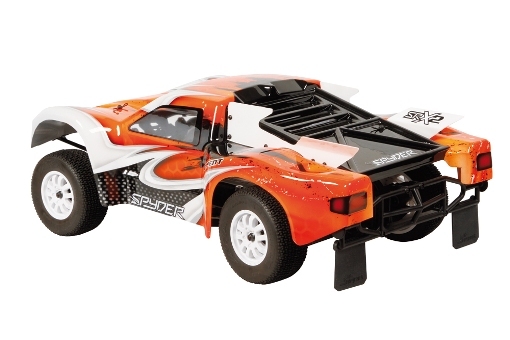 Q: Have you raced and will you be racing the Spyder SCT regularly yourselves, and if yes what will be the main events in 2014 ? A: I have started to race it more and more. I plan on this to continue. Its really tough though with my involvement with all the cars as I race the ones im working on at the time. I do enjoy electric offroad though as its much easier to just “go racing” than gas. I need less resources as well as less time to prepare. My first real race with our SCT will be at the ROAR Nationals at Space Coast in Cocoa Florida. Thanks Billy for the answers and more in dept look at your work designing the cars. Good luck with next designs and racing !